For the last four years, the only “fresh sign” we get is of doom! Economic prospects are flagging across Europe, Japan and big emerging markets such as India, a turn that presents fresh challenges to the relatively robust U.S. economy at a time when the world needs a dependable growth engine. Multiple strands Friday pointed to slackening economic vitality across the globe. Unfortunately, the US is in no condition to play the role of a “dialysis machine”! The low-growth outlook is raising questions over whether weak demand could wash onto U.S. shores in the coming months, even as American businesses and consumers benefit from falling gasoline prices heading into the holiday shopping season. America’s economy has grown steadily this year after a first-quarter contraction, and employers have added more than 200,000 jobs a month for nine straight months through October. But consumer spending and business investment in the U.S. was muted in October, suggesting the U.S. might provide insufficient demand to help buoy other economies. Our scorecard for the Fed indicates that although the institutional set up of the Fed scores well on some criteria, there is room for improvement in others. But, is there a need for the Fed as an institution to change? The Fed’s performance in recent years has been extraordinary. It has been able to bring down inflation in the United States to the 2 percent level, which can reasonably be characterized as being consistent with price stability, while the economy has been experiencing the longest business cycle expansion in U.S. history, with very high rates of economic growth. As my son likes to say, “It don’t get no better than this.” The natural question then arises: If it ain’t broke, why fix it? However, our Fed scorecard suggests that we do need to consider institutional improvements in the way the central bank operates. The absence of an institutional commitment to price stability, along with weak Fed transparency, which stems from the absence of an explicit nominal anchor, leaves the Fed open to political pressure to pursue short-run objectives (i.e., job creation). This might lead to time inconsistent expansionary policy and would produce inflation. In the past, after a successful period of low inflation, the Federal Reserve has “fallen off the wagon” and reverted to inflationary monetary policy—the 1970s are one example—and, without an explicit nominal anchor, this could certainly happen again in the future. Indeed, the most serious problem with the Fed’s institutional framework and the way it currently operates is the strong dependence on the preferences, skills, and trustworthiness of the individuals in charge of the central bank. Yes, the Fed under Alan Greenspan has been doing a great job, and so the Fed’s prestige and credibility with the public have risen accordingly. But the Fed’s leadership will eventually change, and there is no guarantee that the new leadership will be committed to the same approach. Nor is there any guarantee that the relatively good working relationship that now exists between the Fed and the executive branch will continue. In a different economic or political environment—and considering the possibility for a backlash against the Fed’s lack of accountability—the Fed might face far stronger attacks on its independence and increased pressure to engage in over-expansionary policies, further raising the possibility that inflation will shoot up again. So what should the Fed do? The answer is that the Fed should continue in the direction that it has already begun to increase its transparency and accountability. First, it should advocate a change in its mandate to put price stability as the overriding, long-run goal of monetary policy. Second, it should advocate that the price-stability goal should be made explicit, with a numerical long-run inflation goal. Government involvement in setting this explicit goal would be highly desirable, making the Fed goal independent, which should help retain public support for the Fed’s instrument independence. Third, the Fed should produce an “Inflation Report” type of document that clearly explains its strategy for monetary policy and how well it has been doing in achieving its announced inflation goal. The outcome of these changes is that the Fed would be moving to an inflation-targeting regime of the type described in our book, which has been recently published by the Princeton University Press (Bernanke, Laubach, Mishkin, and Posen, 1999). Clearly, the U.S. Congress and executive branch need to play an important role in encouraging the Fed to move toward inflation targeting. A detailed outline of a proposal for how this might be done can be found in our book. I leave you to read it on your own. Otherwise, you will be subjected to another full lecture. There´s some irony here! The inflation chart shows that from the moment Mishkin gave his lecture, inflation never deviated significantly or for too long from the “imaginary” 2% “target”. Curiously that only happened after Ben (“inflation targeter”)Bernanke took over at the helm of the institution in January 2006. Even more ironic is the observation that as soon as the 2% target was made explicit in January 2012, inflation said its “good-bye” and it´s been almost three years since it has “gone”! Interestingly, prior to the Fed engineered “Great Recession”, you could say either that the Fed in fact was targeting 2% inflation or that in fact it was level targeting NGDP along a 5.4% growth path. They were “observationally equivalent”. The depth of the crisis is very likely a consequence of the Fed losing either of the “imaginary” nominal anchors. 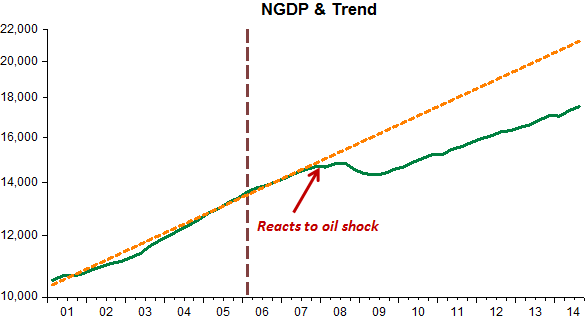 The stated nominal anchor (2% target inflation) in January 2012 has never materialized, while the lower level path for NGDP following the crisis, along which NGDP grows at a 4% trend rate, is also in danger of being further “downgraded”, given that for the past couple of years NGDP has remained below the “revised” trend (notwithstanding Lars Christensen´s enthrallment with “the remarkably stable US post crisis NGDP”). 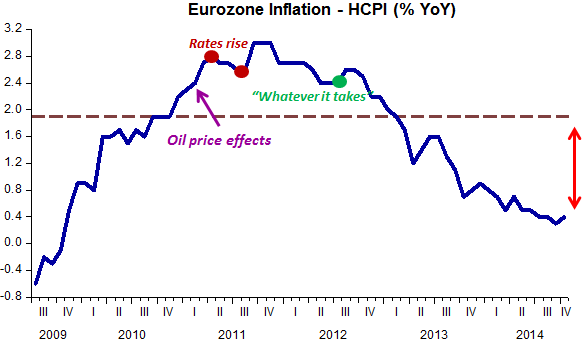 The story´s moral: Inflation is a very misleading target for a central bank (at least once inflation has been conquered). The real economy – employment and RGDP growth – would be much better off if the Fed chooses an NGDP level target as its nominal anchor. In that event, inflation would simply not be an issue! PS I know the inflation target refers to the headline PCE. 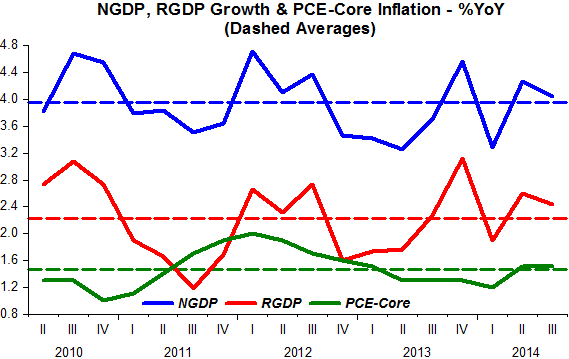 But the inflation trend is much better indicated by the Core PCE. Accounting says US growth will (finally) pick up! 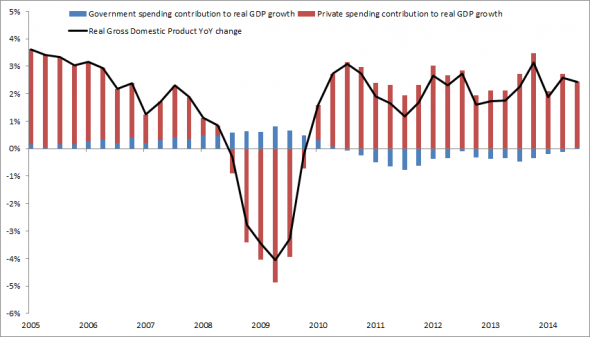 It’s no secret that spending cuts (and tax hikes) have retarded America’s growth for the past four years. But data from the Bureau of Economic Analysis suggests that the era of austerity may finally have ended. A little more than half of the total decline in government spending since the middle of 2010 is due to military cutbacks, some of which obviously has to do with the withdrawals of US forces from Iraq and Afghanistan. Since the start of 2012, more than all of the decline in government spending can be attributed to reduced defence expenditures. For better or worse, this austerity also seems to have come to an end. So while real nondefence spending is still about 5 per cent below its peak, real defence spending is about 12.6 per cent below its peak. Some of that is welcome, since it can be explained by the end of wars and recovery from the trough of the recession, but some of it represents a self-inflicted wound. The good news is that an increase in the military budget might actually be something the politicians can agree on. I would say: to get the economy really “booming” let´s start a new war! Interesting to note in the “flagship chart” above that from 2010 to mid-2011 “austerity was on the rise, declining since then and now it´s finito. However, both during the periods of rising and declining “austerity” real output growth chugged along at a very stable 2.2% growth rate! I have a hard time figuring out why now, with “austerity” having ‘retired’, that would change! Visions of grandeur. Or analyzing data with 3D lenses! GDP registered its best six-month stretch since 2003 in the period ending Sept. 30, Commerce Department data out Tuesday showed. The resurgent growth alongside steady labor market improvements this year suggest the economy is on solid footing despite uncertainty abroad. GDP has now expanded for two straight and 19 of the past 21 quarters. Those 63 months of only briefly interrupted growth stretch out longer than the post-World War II average of 58 months for recoveries. But strip out some of the quarterly volatility and the economy’s performance remains unspectacular. Both have the same average (2.2%) but the volatility of annualized growth is more than 3x greater. 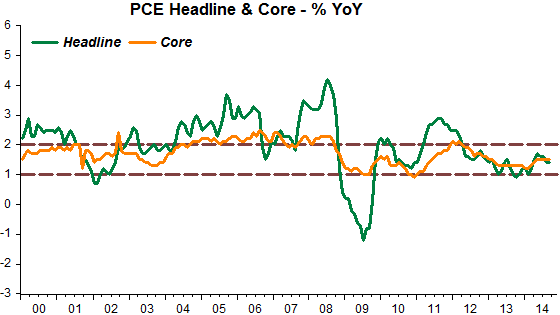 Don´t forget that it was from focusing attention at the volatile component of headline CPI/PCE that led the Fed to fear inflation “getting out of hand” back in 2008! We all know (and feel) the consequences. There´s absolutely nothing new on the economic front! So why there´s so much talk about “policy normalization” (i.e. increase in rates)? 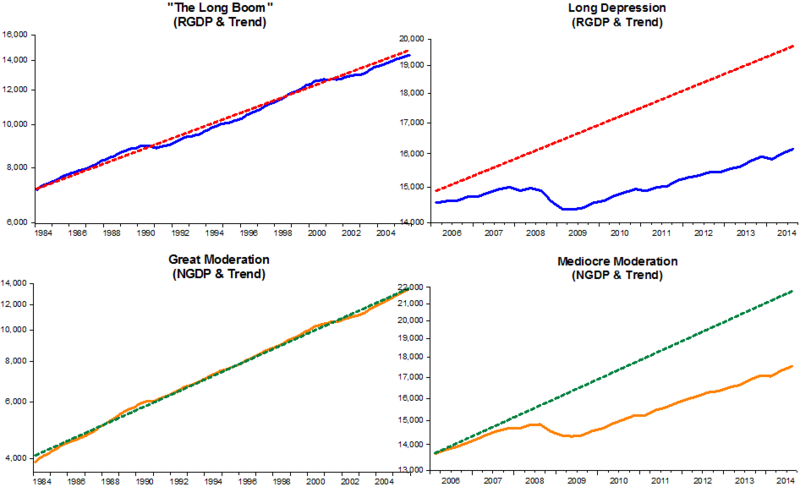 Since the economy “pulled-up” from the “gutters” of the “Great Recession” a “mediocre moderation” has established itself. It´s growth all right, which is more than the EZ, for example, can flaunt. But in this case, doing better than the Jones´ is not the appropriate yardstick! It only self-serves the US policymakers. 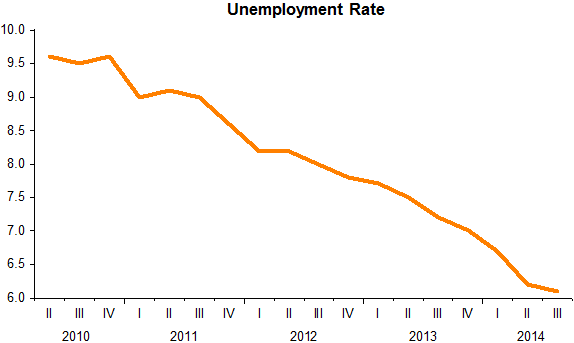 Maybe the persistent drop in the unemployment rate over this period is “side-tracking” monetary policy makers. Inflation below target is “good” and if unemployment is reaching “full employment” the time is nearing for “us” to act! 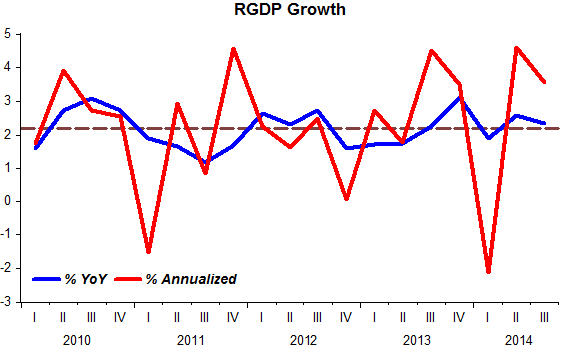 Earlier this year, before the quarter1 GDP release, the NGDP Indicator was pointing to growth remaining close to 4%. At the time so was Justin Irving´s real time NGDP forecast, but now it´s down a notch! Remembering Ronald Reagan, Federal Budgets And Inflation-Fighting. John Cochrane Fights Economic History Again? Nearly forgotten today, a younger version of Meltzer served as an Acting Member of President Ronald Reagan’s Council of Economic Advisers in 1988-9. Ten years after his stint on the CEA, Meltzer recounted the Reagan Days (1981-1989), in a piece entitled, Economic policies and actions in the Reagan administration. “Uncertainty and lack of a coherent monetary policy were not limited to 1981-82. During the years 1984-87, the Reagan administration shifted from a freely fluctuating exchange rate to encouraging dollar devaluation first by talk and then, in 1986, by increasing money growth. These actions were followed by a decision at the Louvre in January 1987 to set a band for the exchange rate against principal currencies. Within a few months, the dollar was overvalued relative to the agreed-upon rates, so maintenance of the band required increased money growth in Germany and Japan and lower money growth in the United States. The band required higher interest rates. Between July and October 1987 interest rates on long-term U.S. government bonds increased approximately 25 percent (from 8 1/2% to about 10 1/2%). When anticipations of further increases in interest rates contributed to a rather dramatic decline of prices on the world’s stock exchanges, the administration shifted its position again. The dollar declined about 8 to 10 percent below the presumed bottom of the previous band. Meltzer is a tough, even acid critic. But John Cochrane, University of Chicago scholar? Not so much. Today Cochrane hails the Reagan-Volcker Team as Dynamic Duo Inflation-Busters. At first blush, this is puzzling; Cochrane’s recent “Neo-Fisherite” stance declares the Fed can fight inflation by lowering interest rates, which sets off lower inflationary expectations—and voila! You get lower inflation. In the comments section of his blog, I asked Cochrane about the accepted Fed Chairman Paul Volcker story, that an indomitable Volcker mightily raised rates and thereby broke the back of inflation. That is not a Neo-Fisherite story line. Cochrane has a nifty definition of federal surplus that is kin to what business people would call an “operating budget.” That is, what is the profit or loss a business makes on operations, before debt payments. Cochrane’s point is that Reagan ran an operating surplus, also called a primary surplus—taxes were greater than operating outlays. It is an interesting vessel of an idea, the only problem it also leaks water like Niagara. The Reagan deficits were so vast that even without debt payments The Gipper ran rivers of red ink. Well, Reagan came close to a balanced operating budget in 1988, but no cigar, and most of his Presidency was a gathering ocean of red ink, even his primary budget. The year 2000, btw, was President Clinton’s last year in office, in which he ran an operating surplus, or primary surplus, of $459.1 billion. One might ponder if any organization ever in history ran such a large operating gain. Cochrane has been pushing a Neo-Fisherite stance, but too often he seems to run headlong into a granite wall of opposing empirical and historical facts. As Meltzer points out, there was no coordination, or joint contraction, of fiscal and monetary policy in the Reagan Administration; Reagan ran big deficits and Volcker raised interest rates to the moon in 1980. By luck or otherwise, inflation cracked quickly to under 5%, so Volcker eased up, as is seen in sliding interest rates and bulging M1 and M2 supplies in the 1980s. Meanwhile, Reagan kept running huge deficits. This is not a Neo-Fisherite story. Monetary policy erratically eased and was joined at the hip with big federal deficits after 1981. But the real story remains lost to Cochrane, and others, I fear. The first real story is that the U.S. economy has evolved over the decades to one that is much less inflation-prone than the 1960s and 1970s. The last gasp of inflation was in the early 1980s, when Volcker slay it. Now, Big Labor is dead, Big Steel too, Big Telecommunications, Big Oil, Big Autos, Big Anything. International trade has exploded, reducing supply side bottlenecks and the possibility that an economy can “overheat.” The Wal-Mart import-a-rama scheme is the norm. Americans would have to buy a lot of cars to allow global automakers to engage in price gouging. More than they could ever buy. Multiply that example a thousand times over, in every product category. Meanwhile, top marginal tax rates have been cut in half, while financial, telecommunications and transportation industries have been deregulated. Capital is everywhere, gluts of it. The Internet has made sourcing easy and global, and simultaneously opened local markets—second and grey-market goods are easily traded now. The real story is inflation is dead. The second real story is the one Market Monetarists know: A central bank that fixates on inflation or interest rates is not doing its job, which is properly focused on economic growth. Oh, that? Yes, that. 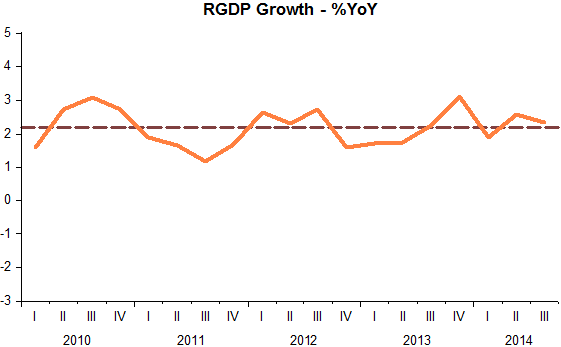 A central bank best obtains a good result on that by trying to keep nominal GDP growth on a steady growth path. I guess that is just too easy. Inflation will wreck America, suggests Meltzer. FRANKFURT—European Central Bank President Mario Draghi sent a strong signal Friday that the central bank is ready to “step up the pressure” and expand its asset-purchase programs if inflation fails to show signs of quickly returning to the ECB’s target. “We will continue(!) to meet our responsibility—we will do what we must[“whatever it takes”, again?] to raise inflation and inflation expectations as fast as possible, as our price stability mandate requires of us,” Mr. Draghi said in a speech to a banking conference. “If(!) on its current trajectory our policy is not effective enough to achieve this, or further(!) risks to the inflation outlook materialize, we would step up the pressure and broaden even more the channels through which we intervene, by altering accordingly the size, pace and composition of our purchases,” Mr. Draghi said. There was very little said about today´s CPI release. Funny that when inflation remains below target we don´t hear much, unlike earlier this year when it was thought that inflation was climbing towards the 2% target! 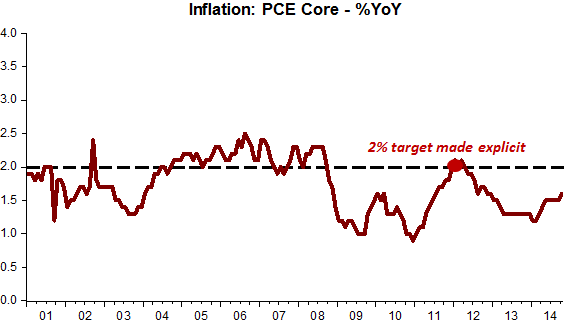 The Fed targets PCE inflation, which on average comes about 0.4 points below CPI inflation. The charts below give a pretty good indication that inflation has not been a problem for quite some time, particularly if you track the Core versions of the indices, which take out the noise from things like oil and commodity shocks! The final chart illustrates how (CPI) long-term inflation expectations have behaved. 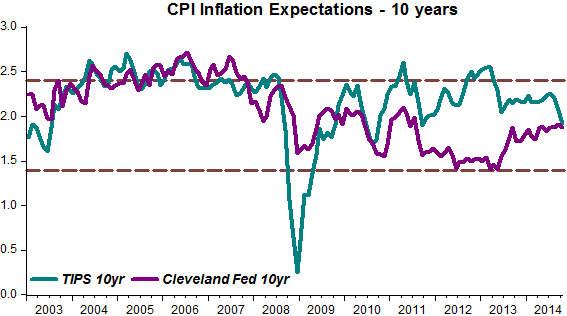 Interesting to note that before the crisis hit, both the TIPS and Cleveland Fed measures of expected inflation were quite similar. I have no idea why that changed after 2008, but maybe they are “joining-up” again. 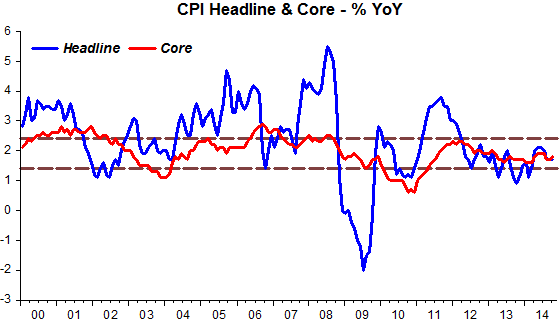 The charts seem to indicate that what the Fed has wanted for some time is really to keep inflation within a 1%-2% (1.4%-2.4%) band for the Core PCE (Core CPI). And they are doing a damn fine job, no matter what else is (not) happening! The Federal Justice System is a lot better at parsing evidence! 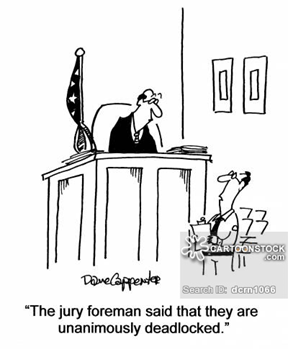 In economics you usually get “hung juries”. Alan Krueger, former chairman of President Barack Obama’s Council of Economic Advisers and a professor at Princeton University, wrote an influential paper earlier this year arguing the long-term jobless face such unusual challenges in finding work that policy makers should count them out when trying to gauge potential unused capacity in the labor market – also known as slack—and its effect on inflation pressures. New York Fed: “The results suggest that there is little difference in how long-term and short-term unemployment affect wages, and as a consequence, the long-term unemployed shouldn’t be dismissed when evaluating labor market slack,” the New York Fed authors say. The economic collapse in the wake of the global financial crises (GFC) and the weaker-than-expected recovery in many countries have led to questions about the impact of severe downturns on economic potential. Indeed, for several major economies, the level of output is nowhere near returning to pre-crisis trend (figure 1). Such developments have resulted in repeated downward revisions to estimates of potential output by private- and public-sector forecasters. In addition, this disappointment in post-recession growth has contributed to concerns that the U.S. economy, among others, is entering an era of secular stagnation. However, the historical experience of advanced economies around recessions indicates that the current experience is less unusual than one might think. First, output typically does not return to pre-crisis trend following recessions, especially deep ones. Second, in response, forecasters repeatedly revise down measures of trend. But maybe that´s not what the evidence shows, at least for the US. In the chart below we observe that the 3.3% trend growth formed in the 1870-1928 period remained true going forward. Even after the “Great Depression” real output returned to the original trend level path! 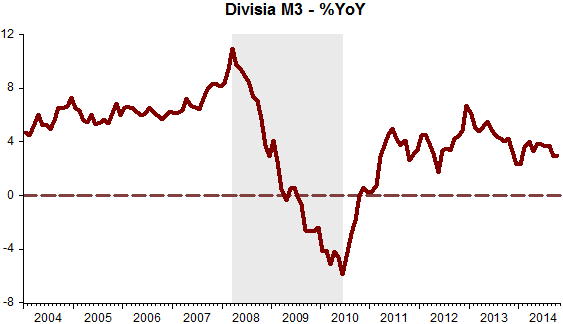 Under Bernanke´s watch RGDP dropped well below trend and shows no signs of returning to it (actually it is growing at a rate significantly below (2.2%) the trend rate (3.3%). 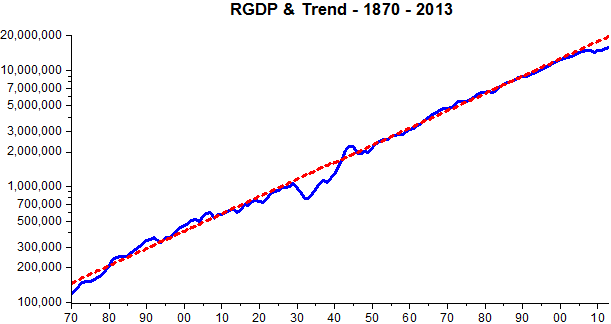 The next chart shows the more recent (from start of the “Great Moderation”) behavior of RGDP relative to the “centenary trend”. 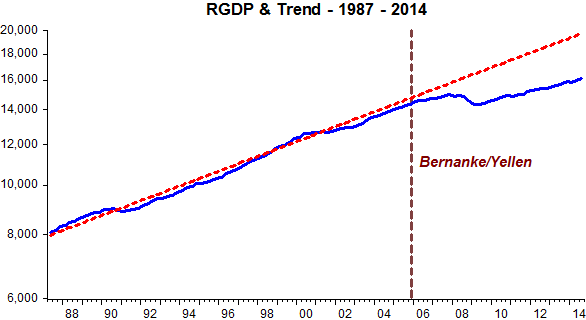 The Bernanke´s Fed failure is starker in the more recent version of the chart. 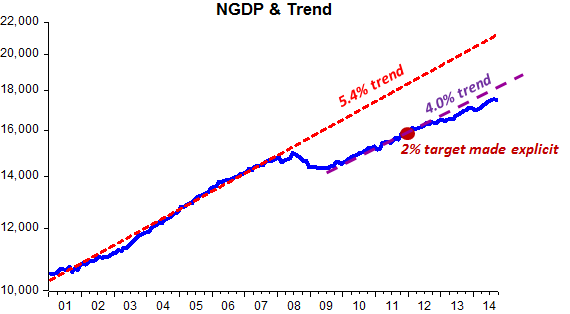 The last chart indicates the “culprit” was the Fed by first allowing NGDP (because of oil price-inflation worries) to deviate persistently from trend and then tumble. Policymakers seem to be making the best efforts, for the first time in at least one century and a half, to keep real output permanently below trend, and increasingly so!